All the rest elements are auxiliary ones and can stay hidden. 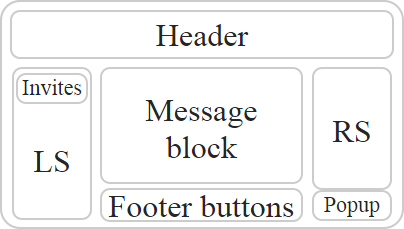 Thus, the first step foresees clicking on all blocks, except of RS – Right Sidebar. After it, you will see only a chat page with a chat block, a list of contacts and extra elements from ChatOS (a window of inbox, a list of followers and etc.). Thus, the first step is complete, 2-4 clicks and the site is ready. It is easy, isn’t it? A work with three or six browser windows. The mode of functioning is the same as for both blocks. Decide how many browsers you want to use simultaneously and just click on the corresponding square. After it, the window will be shifted to the chosen space and modified in size. Thus, you can place: 2,3,4,5 browser windows on the desktop and they will be simultaneously visible. You will see all chats and it will be easy for you to switch them. Place a window where you wish. Convenient? Text us, please, if you have any comments or suggestions about our system. Sincerely, the ChatOS team.